During Nintendo’s Direct yesterday, one of the surprising announcements came in the form of a bite-sized version of the world’s favorite sandbox building block game, Minecraft. Minecraft has been made for the New 3DS, and it’s available immediately for $29.99, like the Wii U and Switch versions of the game. 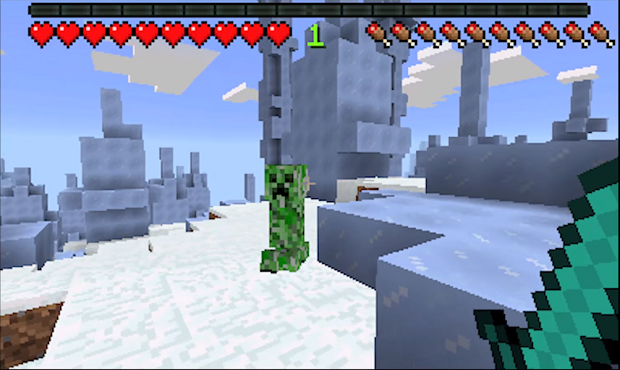 Immediately, Survival and Creative modes are available as well as five skins and two texture packs. Minecraft 3DS will also include touch screen controls, as well and inventory management, crafting and a map all from the bottom screen. Currently, Minecraft 3DS is only available on the Nintendo eShop, but a physical release will be coming in the future. Minecraft 3DS will be exclusive to New Nintendo 3DS and New Nintendo 2DS systems. For more information, visit the official website.